Children with progeria, a rare disorder that causes premature aging, die in their teens of ailments that are common in octogenarians: heart failure and stroke. Kan Cao, a University of Maryland assistant professor of cell biology and molecular genetics, urgently wants to help find a cure. Cao and her colleagues have taken a big step in that direction, showing that a toxic protein destroys muscle cells inside the patients’ arteries. The researchers suspect the damaged arteries are more prone to failure. Until now, researchers didn’t know what mechanism may be causing the patients’ deaths. 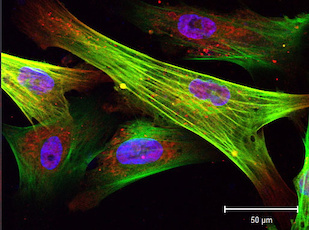 They knew a genetic mutation makes patients’ cells produce progerin, a toxic form of a protein that, in healthy people, forms the skeletal structure of cell nuclei. In previous studies Cao and others found that progerin builds up in cells of elderly people, suggesting that it is also linked to normal aging. But progerin’s effects on cells were unknown before this study. Cao’s team couldn’t obtain human smooth muscle cells from progeria patients for their study because the process would be too invasive, so they used induced pluripotent stem cells—adult cells reprogrammed to behave like embryonic stem cells and develop into a variety of cell types. Cells constantly repair damage to their DNA, Cao explained, and they have several ways to get the job done. When one strand in the DNA double helix breaks, cells usually use the unbroken strand as a template to make a perfect copy. PARP-1 is supposed to sense the break and start this repair process. In the study’s normal smooth muscle cells, that’s what happened. But sometimes a cell simply splices two broken DNA strands together end to end. If the right two strands reconnect, the cells resume normal reproduction, splitting to form two new daughter cells in the process called mitosis. But if the repair isn’t right, those cells can’t successfully split. After the faulty repairs, these cells could not split their contents evenly during mitosis. Some cells kept trying to divide and eventually died trying, in a phenomenon called “mitotic catastrophe.” Others failed to divide and ended up as one cell with two nuclei. Researchers think that after losing so much smooth muscle tissues, the arteries are easily damaged by mechanical stresses such as blood pressure, making them vulnerable to failures in the form of coronary artery disease or strokes. They’ll test that in the next phase of their research, and will try to determine why progeria cells do not use the best pathway for repairing DNA damage. They also plan to use the smooth muscle cells derived from human induced pluripotent stem cells to test new treatments for progeria. This research was supported by the National Institute on Aging (NIA) of the National Institutes of Health (NIH) under Award No. R00AG029761. The content of this article does not necessarily reflect the views of the NIH. 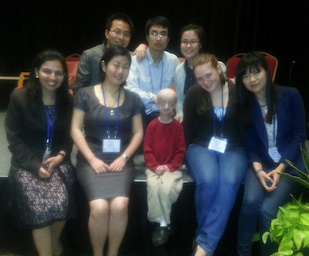 The research paper “Mechanisms controlling the smooth muscle cell death in progeria via downregulation of Poly (ADP-ribose) polymerase 1,” Haoyue Zhang, Zheng-Mei Xiong and Kan Cao, was published online May 19, 2014 in Early Edition of the Proceedings of the National Academy of Sciences.